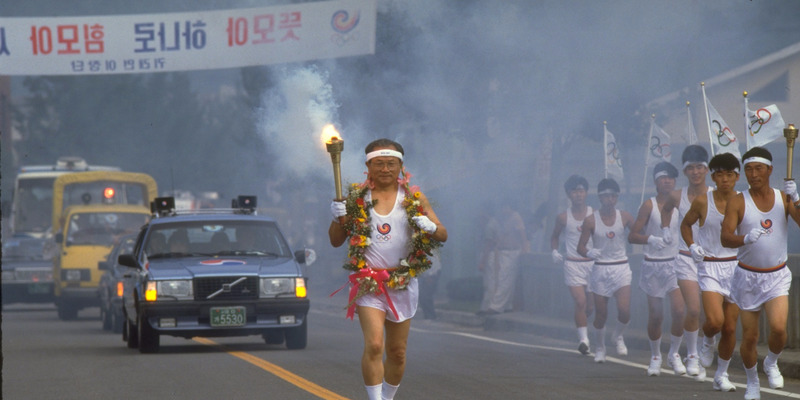 Joe Patronite / Stringer/Getty ImagesAn athlete from Korea carries the Olympic torch during the 1988 Olympic Games in Seoul, South Korea on September 13, 1988. North Korea was a major threat to Seoul’s 1988 Olympic Games. US spies were worried that North Korea would “ruin” the Games, after being denied the opportunity to co-host with South Korea. North Korea remains as high a priority as ever as South Korea prepares for the 2018 Winter Olympics in Pyeongchang. North Korea has been a major threat to the Olympics ever since South Korea was a host in 1988. According to recently declassified CIA documents obtained by The Los Angeles Times, CIA spies were worried that North Korea would “ruin” the 1988 Seoul Olympic Games and use a network of existing agents to carry out terror attacks. “We believe that violence perpetrated by North Korea is the highest security threat to the games,” a 1986 CIA assessment read. The CIA appears to have begun examining the threat of North Korea even before a North Korean agent blew up a Korean Airlines plane in 1987. The agent who planted the bomb on the plane, Kim Hyun-hui,told the BBC she did so under orders that apparently came from a member of the Kim family as a ploy to cause chaos before the Olympic Games. Prior the the bombing, North Korea wanted to co-host the Olympics and saw Seoul’s refusal to cooperate as an attempt to divide the Peninsula. Three years of negotiations between South and North Korean Olympic delegations proved unsuccessful, after North Korea turned down the offer to host a handful of events, leaving the international community concerned about potential backlash. “We think the North faces a difficult choice between accepting a decidedly junior role in Seoul’s Olympic triumph or rejecting the games and perhaps further tarring its reputation in an attempt to disrupt them,” CIA agents wrote following the failed talks and growing instability in North Korea. US agents were also increasingly concerned about Seoul’s security efforts to prevent an attack from the North. Despite tensions, the 1988 Games were considered a success. As South Korea finalises its preparations for the 2018 Winter Olympics in Pyeongchang, the threat from North Korea remains as high a priority as ever. Tensions have risen between North Korea and the US in recent months, increasing concern over North Korean retaliation and general safety at the upcoming Olympic events, which are set to take place just 50 miles (80 kilometers) from the fortified border with North Korea. In September, France said its team would skip the 2018 games if South Korea could not guarantee their security. And the US Olympic Committee said it was working with relevant authorities to make sure its delegation would be protected. Do Jong-hwan, the South Korean minister of culture, sports and tourism, told reporters in September that South Korea has been diligent with putting the correct safety measures in place. According to Reuters, South Korea’s Defence Ministry will deploy 5,000 armed guards at the Pyeongchang Games, and will also increase cyber security measures to guard against hacking from the North. Documents obtained by Reuters show the Pyeongchang Olympic Committee is set to spend 20 billion won ($US17.6 million) in screening security measures and another 1.3 billion won ($US1.2 million) on cyber security. A new defence unit called the Special Weapons and Tactics team was specially created to guard against terrorism around the Games, Reuters said. “(We) will thoroughly prepare the Pyeongchang Olympics so that it may be regarded as the safest Olympics in history,” a foreign ministry official said in October.